I reckon Prince of Wales’ Feathers is one of the most beautiful of ornamental vegetables. Question: I’m new to gardening in Brisbane and I want to grow Prince Of Wales’ Feathers. I started growing Celosia argentea var. plumosa in 1974-76 when I lived in London. I grew them as a cash crop in my greenhouse – the funds raised paid for the fuel consumed keeping the greenhouse frost-free in winter. I sold them to a local family hardware store as individually potted plants when the flower spikes were beginning to develop some colour. Both flower spikes and leaves are edible, but are best eaten while young and tender. Prepare and use like spinach. The butterfly-attracting flowers can also be dried or used as fresh cut flowers. The most confusing thing about the genus Celosia is its scientific nomenclature. Many names are redundant but still in widespread use. Prince of Wales’ Feather is known as Celosia argentea and Celosia plumosa, but I grew up calling it Celosia argentea var. plumosa. Related Lagos spinach, a food plant in Africa and Asia, but an ornamental summer annual in western countries, is known as Celosia argentea var. argentea, but I grew up calling it Celosia spicata. The International Plant Names Index, which I often turn to for a final determination on the currently accepted scientific name, doesn’t help. Australian and British gardeners call these plants ‘Prince of Wales’ Feathers, because they resemble the royal emblem. Celosia are tropical annual plants, which means they complete their whole life cycle within one year, often less. Celosia germinate freely at 25C, growing best in subtropical Brisbane between October and May. Seed is the easiest way to grow these plants cheaply and in quantity. The fine, black, shiny seeds are sown over the surface of a prepared seed bed: compost-rich soil that has been well dug, firmed, then raked level. The seed is lightly raked into the surface, but not buried. Sprinkle a veneer of chopped sugarcane over the surface, again avoiding burying the seed. This surface mulch helps keep the soil surface evenly cool and moist, helping the seed germinate. Germination takes seven to fourteen days, during which it’s important to water the seed bed twice daily during dry conditions. Thin the seedlings as they grow, if they grow too thickly this can encourage disease. As plants gradually mature you can reduce the frequency of watering to once daily. By harvesting the seedlings as you thin them you can enjoy them at their best quality for eating. Then, once each plant has reached about 15cm wide, stop thinning them and enjoy them for their colour. Celosia growing outdoors may be nibbled by caterpillars. Non-hairy caterpillars can be squashed, but never handle hairy caterpillars with bare hands. Wear gloves, as caterpillar hairs may cause skin irritation, or rashes, needing treatment with anti-histamine. In Brisbane many caterpillars feed at night, so you may need to use a torch to find these pests. 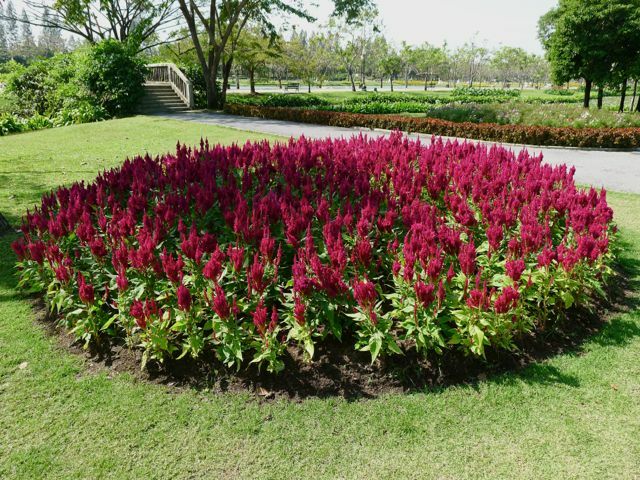 Place Celosia where they receive morning sunshine and afternoon shade. Feed every fortnight using seaweed solution. Good quality seaweed solutions contain between 50 – 60 minerals and beneficial, plant-based compounds useful for robust, healthy plant growth, especially with annuals like Celosia. When the central flower spike dies it can be allowed to dry off and ripen its seed. You can save Celosia seed by placing maturing heads into a paper bag somewhere warm, dry and well ventilated. Remove any debris from the seed, make sure they are completely dry and store them in an air-tight, resealable container (like a small jar) in the fridge. This way seed remains viable for three years. Alternatively, old flowers can be cut off in order to direct energy into producing multiple, smaller, secondary flower spikes. Removal of dead flowers is called ‘dead-heading’ and, by preventing seed production, promotes a longer lasting flower display. Plant now for Australia Day lunch. Lagos spinach, Celosia argentea var. argentea, syn. Celosia spicata, a closely related ornamental edible. Beautiful – but why not grow Amaranth. The flower head is very similar and the leaves edible.